As we know etiquette is a set of the rules that foresees the aspects like "how to behave" in the society, social classes, or groups. The gambling industry has such rules. Especially they will be helpful and useful for the casino newcomers. So what are they? Become acquainted with the law of the country where you play. Maybe it is the most important advice. The player should know if the gambling is legal in that county or state where he plays. Pay attention to your companions during the game. Sometimes we can play with dishonorable persons. That is why it is very important to control oneself and be careful. Certainly you should know the rules of the game before playing. 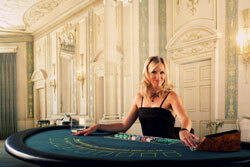 Read our sections dedicated to how to play roulette, slots and blackjack rules first. Never apply a dealer for advice. Don't bet more than you can afford, you should keep within limits. Even if you have a temptation to bet more, don't follow that feeling. Be polite with your neighbors. You should remember and abide this rule, try to control yourself even if the situation is critical. Don't drink a lot of alcohol. You may not even notice how tipsy you are. In such condition a person can do hasty steps. You can make excessive bets. There are games, which require hand movements because verbal instructions are not enough during the game, such process encounters in blackjack and roulette. Don't use abusive language. People don't like such behavior and it will be not a surprise if you will be exiled from the casino. Don't use any cheating techniques. You should know that today is 21 century and the casinos are equipped with modern security systems. The level of security is incredibly high. Don't forget that you can get accusation then notice of appointment and the last one will be imprisonment. Don't bring cameras or other voice-recording equipment. It is highly recommended not to do such things as in most casinos using of them is prohibited. Remember that table games have harsh laws and rules. Don't even try to make collusion with a dealer. Don't add chips to a winning number and especially remove your chips from a losing number after the ball lands on the wheel in the roulette game. You should practice in order to improve your gambling skills and get more experience. Try and learn if you don't want to get into a trouble. You see that the rules are not so difficult. You should understand that knowing the rules of the game is not enough for playing. Follow the rules in order to make the playing process more enjoyable and amicable for everyone.